On the occasion of the inauguration to a second term as President of the Bolivarian Republic of Venezuela, the Freedom Road Socialist Organization (FRSO) sends its warmest congratulations and solidarity to Nicolás Maduro and the people’s movement of Venezuela. We salute the heroic achievements of the Venezuelan people and its political leadership, as you continue their project of building a sovereign nation, independent of imperialism and able to meet the needs of its own people. President Maduro’s re-election confirms that the Bolivarian Revolution speaks to the felt wants and needs of the vast majority of Venezuelans, particularly the working class, campesinos and other oppressed sectors. We recognize that the Maduro government continues to side with the workers and oppressed peoples of Venezuela in the years-long economic war with the comprador bourgeoisie, and we join in the hopes of Bolivarian revolutionaries that a new society will be born out of this struggle. We strongly condemn the latest round of sanctions of the Trump administration against the Venezuelan government, and its refusal to recognize Maduro as the legitimate president of the country. These disgusting displays of interventionism, along with the never-ending threats of war and total destruction, are testament to the monstrous nature of U.S. imperialism. For far too long the U.S. monopoly capitalist class has exploited the peoples of Latin America through its corporations and lackey regimes, enforced by repression and war. The multinational working class and oppressed nationalities of the United States toil under the rule of the same class. The rulers of the U.S. are the only ones that benefit from the continued exploitation and suffering we all experience, and have no right to rule over us for even one day longer. For these reasons, and in the name of proletarian internationalism, the FRSO stands shoulder-to-shoulder with the Bolivarian Revolution and with Nicolás Maduro as its leader. Imperialism must be driven from every corner of this continent — it was forced from Cuba in 1959, and now the Venezuelan people are driving it from their land. Onward to victory across the Americas! 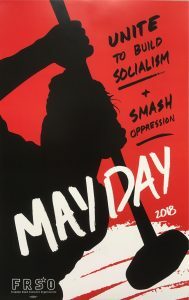 ¡Revolución o muerte — venceremos!